PARTY ECO-RESPONSIBLY. Arborware plates are made from 100% organically grown bamboo. 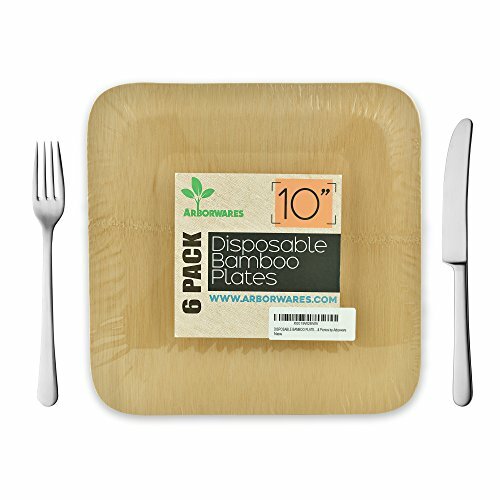 Bamboo is a naturally renewable, sustainable and biodegradable resource making it an ideal product to produce disposable plates from. Better for the environment than plastic or Styrofoam and better looking on your table than paper. 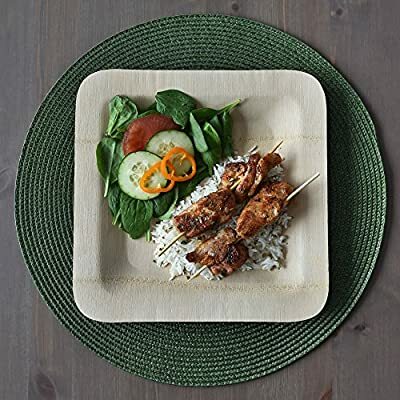 Americans throw out almost 1 trillion disposable plastic tableware items each year - let's reduce that by replacing plastic with compostable and biodegradable tableware. A beautiful, naturally colored, contemporary item intended to be used and enjoyed every day. 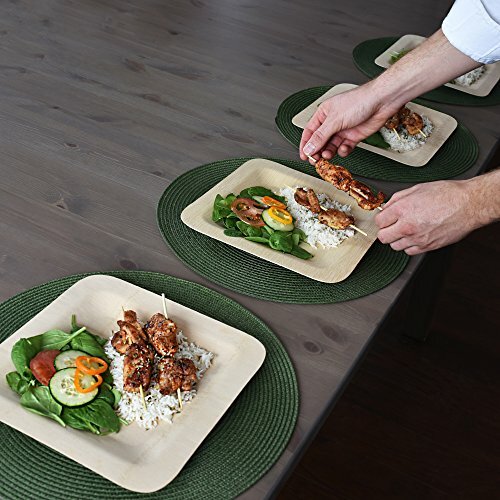 These plates are sturdy, elegant and consistently clean and smooth from plate to plate. Due to the natural materials being used the texture and color of every plate is unique. Perfect for parties and catering events of all types. Impress your guests with the beauty of mother nature's gifts. Use them, guilt-free, at your next: picnic, wedding, birthday, conference, baby shower, bridal shower, cocktail party, luncheon & BBQ. Recommended for single use but they are sturdy enough to go all day long if you need them to! Some of our customers have reported being able to rinse and wipe in warm water to re-use. Not recommended for use in ovens of any type or dishwashers. After use, Arborware plates can be throw in the compost bin (average compost time: 4-6 months). For areas with municipal compost service, just throw them in the green bin. SMOOTH STRONG & STURDY - No ridges or grooves to catch utensils or food. Not flimsy! Holds up to the juiciest & messiest foods. Avoid unnecessary spills and wasted food. 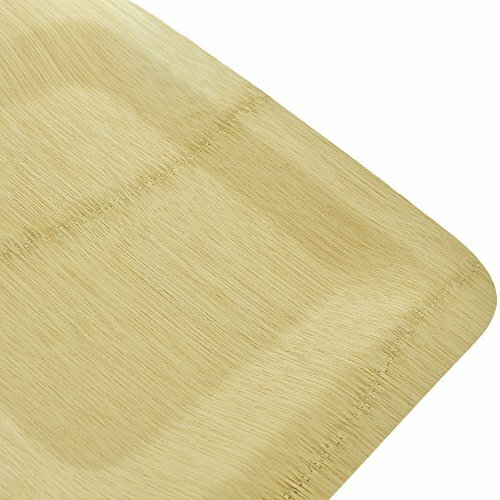 Thickest bamboo plate on the market! VERSATILE & DISPOSABLE - Serve hot or cold foods at all types of catered or private events: weddings, dinner parties, picnics, birthdays, barbeques, family get-togethers, camping. Intended for single use. ECO-FRIENDLY & 100% ORGANIC BAMBOO - Better Than Plastic or Paper! 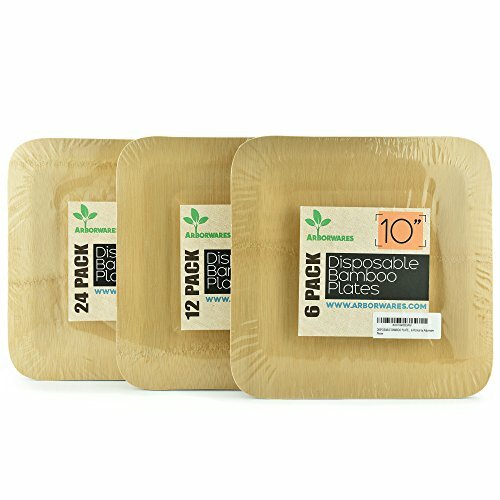 100% Tree-Free, 100% Compostable & Biodegradable. Food Safe! No bleaches, dyes, sealers or stains. Chlorine & pesticide free. Non-Toxic! Made from 100% organic bamboo. GENEROUS SIZE & UPSCALE STYLISH DESIGN - 10 inches holds large portions of food while looking great on your indoor or outdoor table. Adds a rustic yet elegant touch to your event. Great for catering. 100% SATISFACTION GUARANTEED! 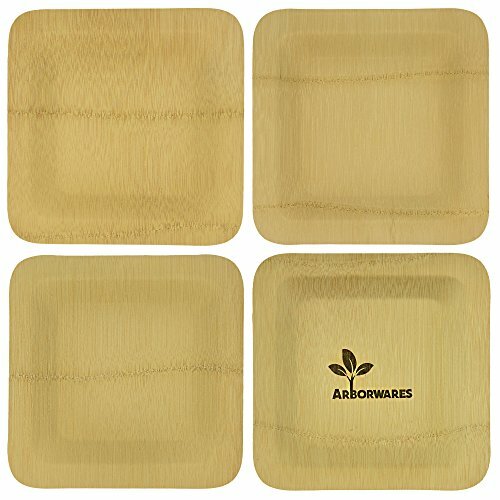 You will love our high quality Arborware plates! Money back guarantee.